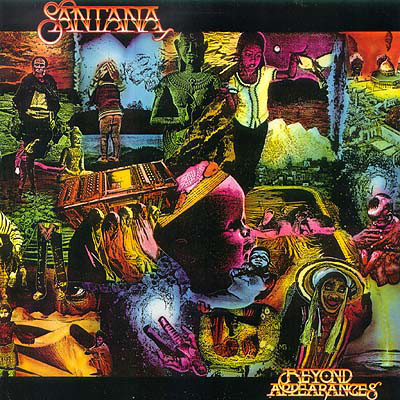 This was the third of Santana's rock/pop albums. It appeared nearly three years after the previous one, "Shangó" and, as it was released in 1985, it was predictably loaded with synthesisers and synth drums. The previous two albums were by far the superior ones to this one, largely because of the eighties instrumentation used far more on here. "Breaking Out" is a catchy, rocky opener with what is actually an acceptable drum sound (for 1985) and a strong vocal. It takes until near the end for Carlos Santana's guitar to kick in, however. When it does it is once again rock guitar as opposed to Latin. "Written In Sand" has a vocal that sounds remarkably like Sting, while the rhythm sounds a lot like Paul Simon's eighties material. Carlos's guitar is sublime. It is a good track, this one. "How Long" begins with some typically eighties synths, both keyboards and drums and a vocal that this time sounds just like Phil Collins. It is a good song, but the eighties production does nobody any favours. The vocals on both these are supplied by the versatile Alex Ligertwood. "Brotherhood" is a short, frantic, synthy semi-instrumental with some occasional semi-spoken rapped vocals. It reminds me of The Clash's "Overpowered By Funk". Very much of its era. "Spirit" is a typically eighties soft rock-ish number, a bit like John Parr's "St. Elmo's Fire". The same can be said of "Say It Again". Look, all these songs are actually good rock songs, I just personally prefer a more traditional rock instrumentation. It doesn't stop this album being an enjoyable one, however. It is just that pretty much everyone who put albums out between 1985 and 1987 buried them in synthesisers - Elton John, Eric Clapton, Phil Collins, Rod Stewart, even The Rolling Stones. All guilty. "Who Loves You" is a catchy, rhythmic rocker, yes again it is synthy, but I still like it. There is no "Jingo"-style Latin stuff on this album, or transcendental meditative jazz fusion on here, but that is eighties-era Santana for you - a different beast, or a beast in different clothes. Having said that, the end of "Who Loves You" features some Latin percussion and chanted Spanish vocals! "I'm The One Who Loves You" has a riff more played out by keyboard than guitar which is a shame, because the soulful vibe and vocal is excellent. It actually is a Curtis Mayfield song. "Touchdown Raiders" is a strong, guitar-powered instrumental, presumably bearing some relevance to American football. I wouldn't know as my knowledge of that sport is non-existent. "Right Now" is a lively, funky-ish poppy number, with some great rock guitar soling from Carlos, mid-song. Look, if you are in search of classic Santana, you won't find it here, but actually, as eighties rock albums go, it is ok. Personally, I quite like Santana's rock/pop phase so it is fine by me. Obviously, I prefer the earlier stuff, but I won't snobbishly dismiss this material altogether, despite its comparative limitations. 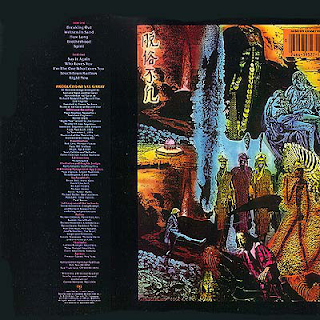 **A piece of trivia about this album is that both drums and keyboards were played by men called Chester Thompson. (One of them used a "D" as a middle initial to differentiate).